The panhandle is on the cusp of seeing some longed-for transportation improvements come to fruition. Disability Rights Nebraska and a number of other organizations located in the western counties have been collaborating with the Department of Transportation to make this dream a reality. 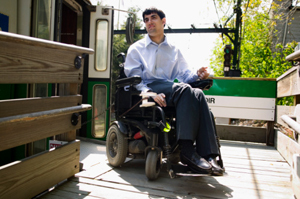 Limited transportation options greatly impact a person with a disability’s access to healthcare, employment, recreational activities and their ability to stay connected to family and friends. For many years, I have struggled to find reliable, accessible transportation for the individuals with disabilities that I worked with. It was troubling to realize that there were so many barriers when faced with the issue of transportation. If your community offered public transit, the hours were very limited and you must call the day before to make a reservation. The transit only ran during the day time, limiting the time that transportation was offered. Many smaller panhandle communities did not have any form of public transportation so people relied on family, friends or local churches to get them from town to town in order to attend doctor’s appointments, meetings, or to visit family members. Let me tell you about one specific incident that really opened my eyes to the challenges faced by a person with mobility limitations when it comes to transportation. I was working with a gentleman who had a doctor’s appointment at our local clinic. That particular day, his doctor recommended that he complete a couple of necessary tests; unfortunately, this made his visit longer than usual – by about 5 minutes. When he went outside to locate the transit bus, he saw the driver leaving the parking lot. He realized that he was five minutes too late. The company policy stated that the bus must head back to the station at 4:00p.m. It was 4:05p.m. He called the transit office to tell them that he was in the parking lot and saw the driver drive away but could not catch him. He was told that he was too late to be transported back home as it was after 4:00p.m. and that he would have to find alternative transportation. He called me, very upset. Since he used a motorized wheelchair to assist with mobility, he needed a vehicle equipped with a wheelchair lift. He was stranded there in the parking lot of the doctor’s office with no other way to get home. I tapped every local resource I could think of, but it was a struggle to get him back home. It was then that I realized how limited his options were every single time he needed to go somewhere. Thankfully transportation options are changing! For the past year and a half, the Department of Transportation has been collaborating with local agencies from around the panhandle, including Disability Rights Nebraska, to really take a look at the needs of each community. We’ve seen great progress from this collaboration: the local public transit services in a couple towns have expanded their service times, and we have added 2 inter-city public transit companies that are starting to serve the whole panhandle. Both companies have accessible vehicles to transport individuals with disabilities and are ready to train their staff in disability awareness. More improvements are on the horizon as this issue evolves and we look forward to seeing how the new changes impact the citizens of the Nebraska panhandle! Mindy Baird is the Community Outreach Disability Advocate in the Scottsbluff office. She has been with Disability Rights Nebraska for 6 years in June. She received a degree in Social Work from Chadron State College in 2002 and has worked with individuals with disabilities for over 20 years. She is an avid walker and enjoys reading, playing poker and spending time with her family. She is married and has 2 children with disabilities, ages 19 and 25.